Usually I lean heavily toward fiction over non-fiction, but I've been trying to read more non-fiction and this book, which I picked up at BookExpo America this year, looked really intriguing. Sonia would grow up to be best known as Maria on Sesame Street. But what happened on the journey that led her there? 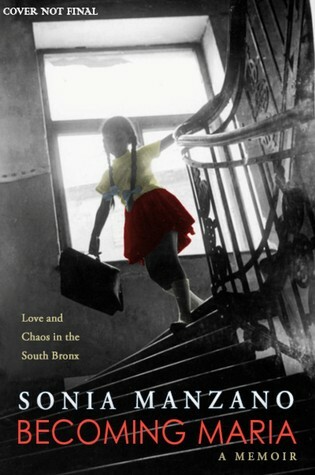 Manzano writes about her rather chaotic childhood growing up in the South Bronx, her bumpy high school career, and the first steps that would eventually lead her to the Sesame Street audition. I really liked the way Manzano dealt with her childhood memories. Rather than trying to package it in a clean, chronological narrative, she titled it "Fragments" and allowed it to be messy and rough, which perfectly reflected the events taking place as well. In the Acknowledgments, Manzano says this: "lives are more often shaped and colored by how we remember those events and the series of feelings that went along with them." This is completely true, and Manzano is more concerned with getting the feeling, the jumble, the mix of emotions and events and she does it well. Even though the narrative begins to feel more cohesive as she recounts more recent events, the style stays consistent. Narrating in first person present tense makes each event seem more immediate and significant. She doesn't sugar coat anything. Her rocky family relationships, her parents' significant problems, her own fears and insecurities are laid out but it isn't all grim. Manzano also doesn't shy away from the good, either, even when the happiness and good things are mixed up in the upsetting or bad. I thought it was so interesting how much she perceived herself struggling with the acting and drama, especially once she goes to the Performing Arts high school. It also shed light on how important teachers are, particularly in inner city areas. A teacher can make or break their students. Sonia had both good and poor teachers, but enough of them encouraged her, or at least gave her opportunities to move forward in her life. I honestly don't have anything to add. I enjoyed it completely. This seems to be written to include a teen audience, which is refreshing. It's nice to see good non-fiction books being published with teens in mind. However, this is definitely able to be enjoyed by anyone who likes a good memoir. I received an Advance Reader Copy of this at BookExpo America - quoted line above comes from this uncorrected proof. This title is now available for sale at your local book store, or you can enter to win my ARC below. Labels: book review, giveaways, Little Lit, memoir, Rebecca T.